I love seven layer dip. It’s such classic party food and for good reason – it’s easy to make, you can put it together ahead of time, it travels well, and it’s (relatively) healthy! All you need is 7 simple ingredients and a big dish to layer them in. Every time I make this I use my 13×8 casserole dish from Crate & Barrel. The instructions here are simple: chop your veggies, prep your beans (thoroughly mix in cayenne and black pepper), put your ingredients in an assembly line, and get ready to layer. This is the order in which I layer my dip. 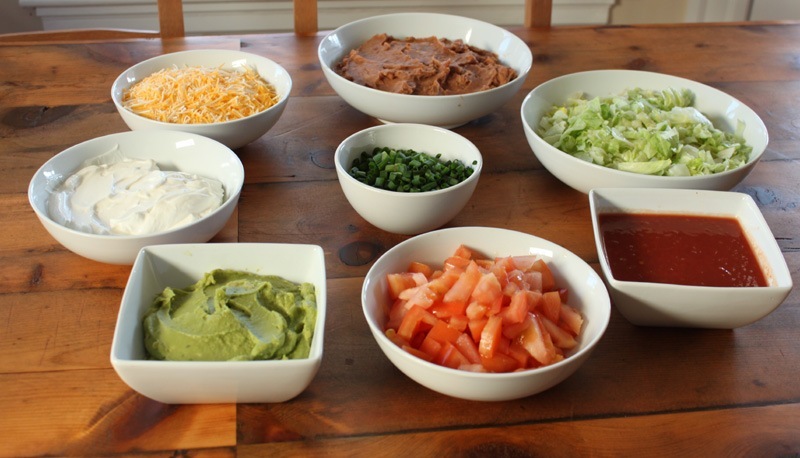 The rule I use is to alternately layer sturdy ingredients (beans, lettuce, tomatoes, cheese) and looser ingredients (salsa, sour cream, guac) so it’s easy to scoop and eat the dip. Make sure you have a big, flat utensil to spread out the layers with while you’re making this dip (I use this). Don’t worry about making the layers perfect, no one will see it anyway! 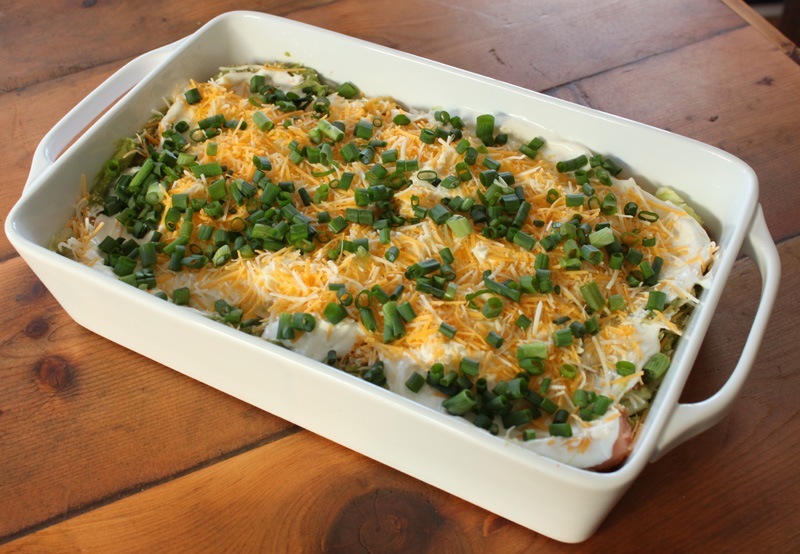 Do spend some time garnishing the top with green onions to make it look pretty though. That’s pretty much it. Enjoy with chips, veggie sticks, or pita bread. 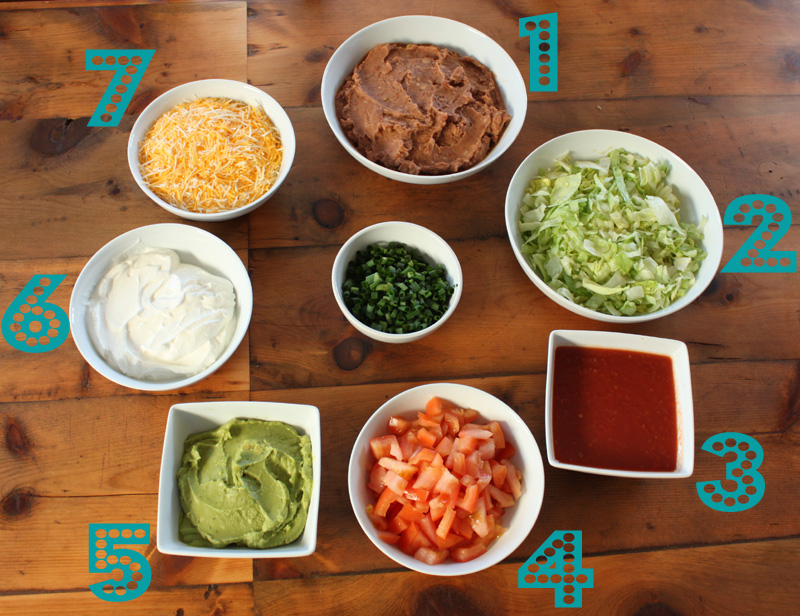 Do you make a seven layer dip? What are your seven layers? My dip is a layer of refried beans, a layer of cheese, a layer of sour cream (I’ve been subbing in yogurt lately), a layer of guac, a layer of salsa and another layer of cheese on top. I heat it up before serving so it gets all melty. Delish! I like the green onion idea. I may have to use that next time! I like it cold but I might try it warmed up! 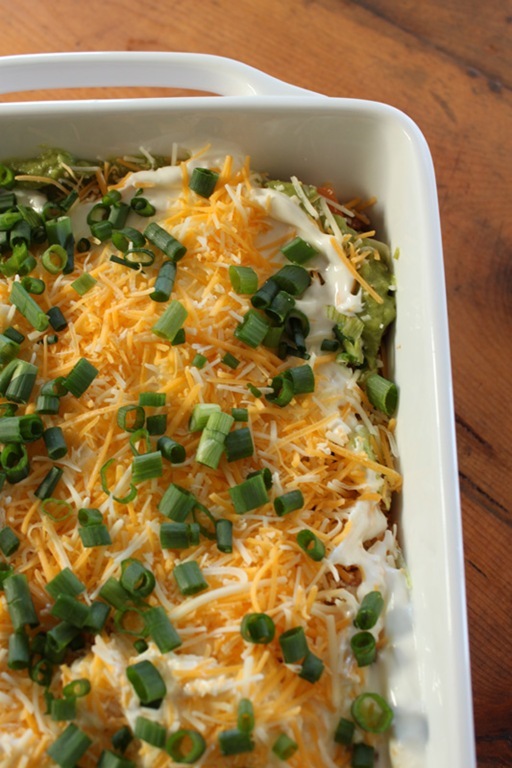 It’s such an easy, crowd-pleasing dip to make. No muss, no fuss, no spills (unless you’re quite clumsy).